Artists set up their easels of their paintings along the waterfront of St Tropez as this is where a majority of the rich and famous disembark. 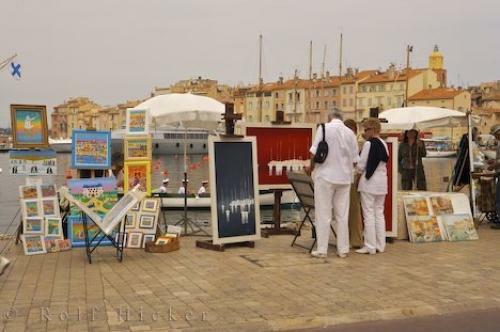 Photo of paintings created by different artists on display along the waterfront of St Tropez in Provence, France. ... If these artists do not make a living along the St Tropez harbour where money is plentiful, then chances are that their paintings will not sell anywhere else.Artist Stalls along the waterfront of St Tropez, The Var, Provence, France, Europe. I photographed this photo with the digital SLR camera model Canon EOS-1Ds Mark II, aperture of f/9.0, exposure time of 1/80 sec. on ISO 100, as always I used a original Canon Lens, the focus lenght for this picture was 51mm.